Jane Daniels called the meeting to order at 6:00 pm. Minutes of the June 10, 2015 meeting were accepted. Financial –Jane reported for Jim Brosnan that the bank balance at the end of June was $2,347.68. Recreational Trails Program Grant: Meryl Harris from Congresswoman Nita Lowey’s office called Jane about the grant. Comments she made indicated that, given the current climate in Congress, approving an appropriation to release funds for the grant are not likely to happen. 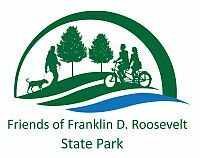 She wanted a copy of the letter that Office of Parks, Recreation and Historic Preservation sent Jane telling her that FoFDR was awarded the grant. Given that funds are not likely to be forthcoming, Jane asked if after the next meeting and, if at that time no movement had been made, we would move forward on the project anyway. No vote was taken, but there was approval of the concept. We would have to find money to finance it. Brian Cole asked if any portion of the project could be an Eagle Scout project because the scout is required to fundraise if money is needed for supplies. Jane said that building the smaller bridge and the boardwalk could definitely be scout projects. The large bridge is a harder and longer project. Brian suggested the possibility of using “crowdsourcing” and ”Go Fund Me” could be a source of funds for materials. Meeting adjourned at 8:00 pm. Next meeting will be on August 12 at the Park Office. Submitted by: Jane Daniels with help from Maria Adams.